This Bridal Pearls in Swarovski Brown Pearls with silver rondells spacer with drop down accent your bridal gown & the bridesmaids dresses too. 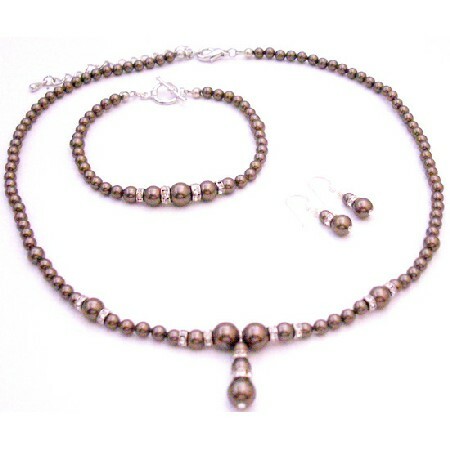 We used Swarovski Brown Pearls are top quality & we offer many items in Swarovski Pearls. Bridal jewelry & bridesmaids jewelry are great gifts & our wedding Pearls jewelry is classic & elegant. Dont forget the mothers when ordering Pearls wedding jewelry. Gorgeous Drop down Necklace diamante silver rondells spacer Necklace with Swarovski Brown Pearls Set. FashionJewelryForEveryone & Gifts is well known for our superb collection of personalized bridesmiad jewelry & bridal jewelry that will last a lifetime. Select from our large collection of bridesmaids gift ideas for your wedding party.